As noted earlier, Hewlett-Packard released its earnings results for the first quarter of its fiscal year a little while ago, and they’re surprisingly good. HP shares are rising after hours on word that the company rather handily beat its own expectations and those of the Street. The consensus view called for it to report 71 cents a share in per-share earnings. HP came in at 82 cents. Sales were also ahead of the consensus, despite the fact that revenue fell in nearly every significant business segment. Still, don’t harsh HP’s buzz with too many details. There’s more to crow about: Net debt of the operating company came down by $1 billion to $4.7 billion, and it’s looking like HP will be close to zero debt for the operating company this year. The results if nothing else buy Meg Whitman and her team some time to quiet the critics who say HP should be split into two or more companies in order to unlock value. That buzz was prominent late in the trading session as rumors flew that a breakup announcement might accompany earnings. As careful AllThingsD readers might have already guessed, a breakup isn’t in the cards, at least not for the time being. The conference call with analysts is about to get under way momentarily and I’m listening in. Expect lots of questions about the balance sheet, and probably more chatter about the breakup idea. One bit of housekeeping: Since I’m in New York, the time stamps are set to Eastern Standard Time. 5:05 pm: Joining the call in progress. CEO Meg Whitman is speaking. She says the restructuring program put in place last year is having the desired effect. Whitman: We improved operating company net debt position for the fourth consecutive quarter. Whitman: Revenue from converged storage products was up 18 percent. Whitman: In servers, business stabilized. We expect to grow market share by 1 percentage point this year. Whitman: Networking showed continued growth, up 6 percent. I was also pleased with performance improvements in printing. New business models and new printers helped boost operating margins. One thing that changed in developing markets is that the price of hardware has increased while the price of ink has dropped. That’s the Ink Advantage program she’s talking about. Whitman: PCs gained 1.4 percentage points of share world wide, and 4 points in the U.S.
Whitman: Total enterprise services exceeded expectations. There is still a long way to go, but I believe that ES (the former EDS) will deliver on the recovery plan put in place last year. Whitman: We are making significant investments to improve our channel partner programs. Whitman: If we can mobilize HPs 300,000+ employees there is nothing we can’t do. Whitman: Turnarounds happen when old and new customers believe. 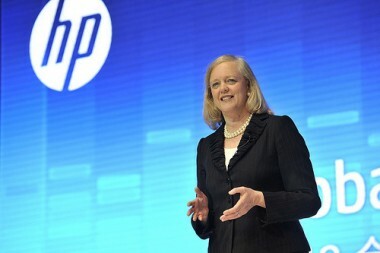 In HP’s case customers are really starting to believe. We saw a number of big wins including one with the U.S. Department of Veterans Affairs. Another is eyewear company Luxottica (sorry if I misspelled that), which hired HP to run its data centers. Whitman: We clearly still face a long road ahead. I don’t like that we saw revenue declines in all our business lines. Restoring growth is a priority and we’re on it. Whitman: It will be toward the end of the year before the recovery plan starts showing up on the top line. 5:14 pm: Whitman: There are a lot of reasons we are in the PC market. She’s addressing again why there won’t be a spinoff of the PC business. Whitman: Pricing continues to be very competitive. In Enterprise Group, we are seeing a tepid market in Europe for servers. Whitman: We will now be breaking out converged storage from traditional storage to better show the growth there. Whitman: Now talking about HP Labs under its new head Martin Fink. Whitman: Talking about Project Moonshot. We expect this to truly revolutionize the economics of the data center. Whitman: If just 10 large web services switched to Moonshot servers, they could save $120 million a year, and 100 million (?) metric tons of CO2 released into the atmosphere, because it consumes so much less power than prior models. Whitman: I’m pleased about Q1 and feel good about the rest of the year. Now CFO Cathie Lesjak is speaking. Lesjak: At the highest level, I would characterize this quarter as one more data point in our consistent, but not linear, recovery plan. Lesjak: Now she’s talking about some new reporting information disclosures. Lesjak: (Going through the numbers again.) From a global economic perspective, we are still seeing headwinds, but some healthier pockets. 5:23 pm: R&D spending declined, though it was because of some tax credits and some contract accelerations in Q4. Lesjak: Europe was a challenge, but we continue to see good signs in Asia-Pacific and Japan. Lesjak: Decline in printer revenue is partially due to a shift toward higher-end printers and away from lower-priced ones. Lesjak: Again, solid growth in server sales in Asia, especially in China. Lesjak: Talking more about the storage business. Q1 was the fourth consecutive quarter where margins expanded. Now Business Critical Servers. Phase two of the trial with Oracle is expected in Q2, which will address Oracle’s breach of contract and damages. Lesjak: In services, we have moved away from unprofitable contracts. Lesjak: We saw strong growth in security and big data software offerings. Now talking about cash and capital allocation. $253 million went back to shareholders through share repurchases, and $258 million via the dividend. Net debt is now $4.7 billion at the operating company level. Lesjak: As we’ve said, 2013 is a fix-and-rebuild year. There are market and macro pressure and some of the ES changes are being delayed. And now we’re heading into Q&A. Question from Bill Shope of Goldman Sachs; he’s asking about the breakup idea. Whitman: We have no plans to break up the company. (Heard that??) HP is better and stronger together. Whitman: We have a terrific set of assets. When you think about our brand, our scale, our distribution, and importantly the customers want this company to be together. We feel strongly it’s better together. Katy Huberty of Morgan Stanley: Earnings on the back half of the year look like they may come down. What else makes you cautious about the back half of the year? Lesjak: It’s really about Enterprise Services not having the runoff in Q1 that we expected. There’s also some challenges about the timing of signings. Lesjak: There’s some cautious optimism there. 5:44 pm: Toni Sacconaghi of Bernstein: Where are you in your cost savings? Lesjak: The non-labor savings are coming in later this year. Question from Ben Reitzes of Barclays: I understand why you want to keep guidance in place, but why not raise the free cash flow target above $5 billion? Lesjak: Glad you pointed out the operating cash flow. We’re happy with it, up 115 percent. We’ve really gotten a lot of discipline. We don’t typically update our cash flow mid year. Best way to think about it is that it was a very big deposit on the year. Question from Shannon Cross: How will you judge the success of the OfficeJet ProX printer platform? How do you think about this versus your laser platform? Whitman: This is an exciting opportunity because it prints at the speed and quality of a laster. We’re going to drive it as hard as we can. We’re going to measure the units installed. With regard to laser we have a great laser lineup, but if there is cannibalization; that’s the way business goes. If there’s going to be cannibalization, better we do it to ourselves than someone do it to us. Missed a question there. Sorry about that. 5:53 pm: Question about Enterprise systems sales. Whitman reminds us that BCS sales got whacked again. But there’s a good product lineup coming. Waiting for another mention of Moonshot. Another question, this one from Mark Moskowitz of J.P. Morgan. Clearly your net debt position is improving nicely. How are you thinking about investment internally from R&D and acquisitions? Whitman: For 2013, we’re still focused on rebuilding the balance sheet and offsetting dilution. We’re going to stay focused on fixing what we have. You never say never, maybe there’s a tuck-in acquisition we have to have, but there’s nothing in the plan. Also, one thing we have to stop doing at HP is increase R&D and then pulling it back, and then repeating that. We’re going to stay on the plan that we have. Question from Brian Marshall at ISI about the software business, where he’s seeing some deceleration of growth. Whitman: The bright spots in software are Vertica and security. Apps and ops are not where we want them to be. We need to make some changes that will kick in by 2014. We have some basic blocking and tackling there. Steve Milunovich asking about PC supplies and inventory. Lesjak: Channel inventory on PCs, overall it’s good. On the consumer side, despite the fact we gained share in consumer we ended a bit higher than we would like. The real star is the channel inventory in printing. We have been dogged by ink supplies inventory being too high for several quarters. Now its down 27 percent since the peak. We’ve had dollar declines over the last six quarters. Whitman: One of the things we’ve asked the business groups to do is limit discounting to get products out the door. It’s healthier for us and better for the channel. It also allows us to differentiate our ink and toner product and get away from the commoditization we were expecting about 18 months ago. Final question from Credit Suisse: About free cash flow. Given the improvement, it looks like you will pay down most of your debt. If you are generating $6 billion to $7 billion in free cash flow each year, how dedicated are you to increasing dividends and buybacks? Lesjak: At the end of the year we’ll be thinking about how we allocate capital around the time of the next analyst meeting. We are committed to returning cash to shareholders. Our view around dividends is that over the long term, our payout ratio should improve as well. We are aligned and working with the board to determine the mix. 6:05 pm: Closing remarks from Whitman: The turnaround is on track and we did better than we expected we would. We have to deliver and continue to execute as an organization. And we’re done. See you next quarter!